BIG CATS – BIG SURPRISE. 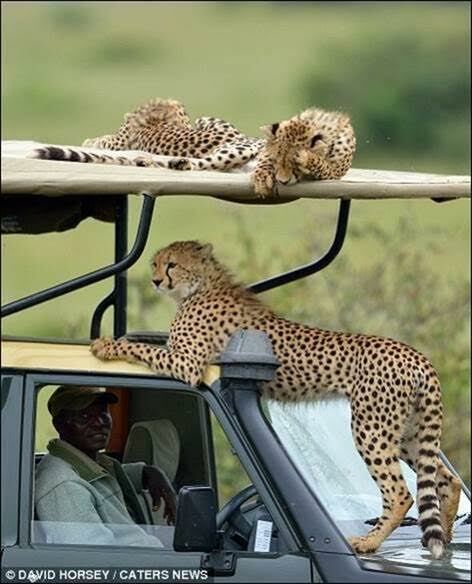 CHEETAHS OF MASAI MARA NATIONAL RESERVE, KENYA, AFRICA. Puma Punku Divine Society celebrates Big Cats as they are icons of Feminine aspect of God’s Power. God created Male and Female and hence God’s Nature is represented by both Male and Female forms. Big Cats exhibit immense power and at the same time bring dimensions of Charm, Grace, and Magic. BIG CATS – BIG SURPRISE. 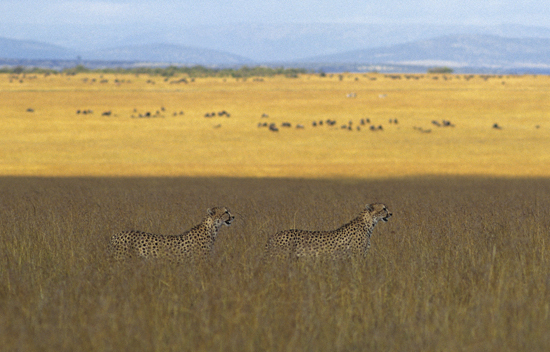 CHEETAHS IN MASAI MARA NATURE RESERVE, KENYA. BIG CATS OF MASAI MARA NATIONAL GAME RESERVE, KENYA, AFRICA. GAVE BIG SURPRISE. 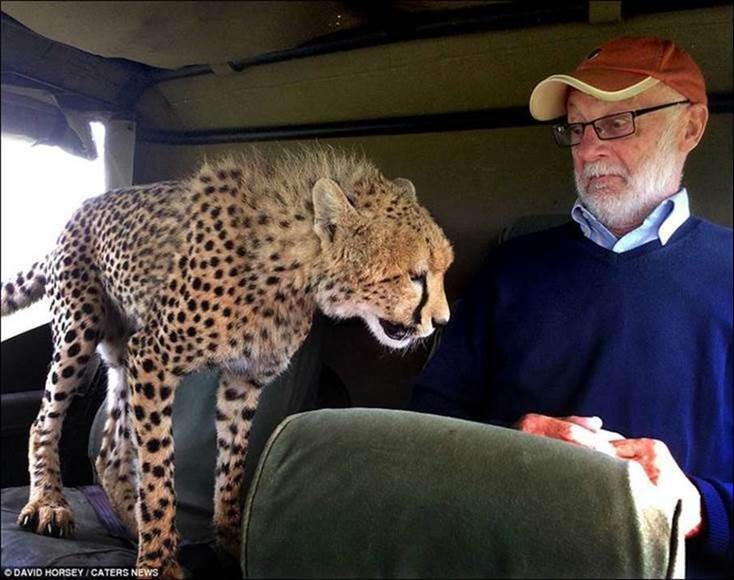 curious Cheetah got up close and personal with a holidaymaker on safari at the Masai Mara game reserve in Kenya when the animal jumped into the back seat of a jeep.The wild cat, with its razor sharp claws and teeth, sure is one kitty you’d rather not have curling up on your lap. 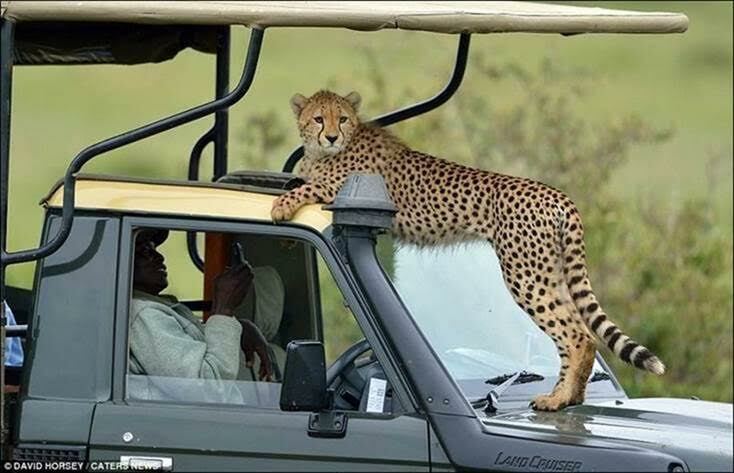 But, nevertheless, the bold animal hopped into the back seat of a jeep as it drove through the African plains – much to the shock of an Irishman inside. After entering the vehicle, it slowly sauntered over to holidaymaker Mickey McCaldin until it was barely a foot away from his face. 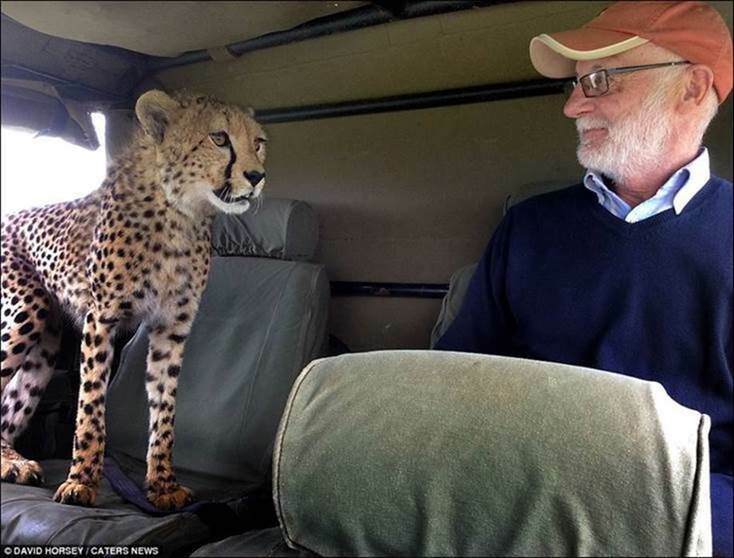 David, 62 from Mombasa, Kenya, said: ‘I’ve been living in Kenya all my life and I’ve never seen anything like this. ‘The cheetah just wasn’t scared of getting up close and personal. At first Mickey was really relaxed but I think he was quite concerned it might try and sit in his lap. 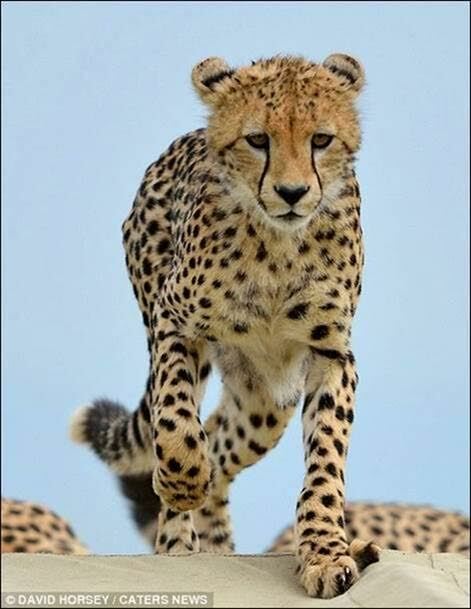 David captured the pictures on June 12, as the group tracked a well-known family of cheetahs, whose mother is called Malaika. 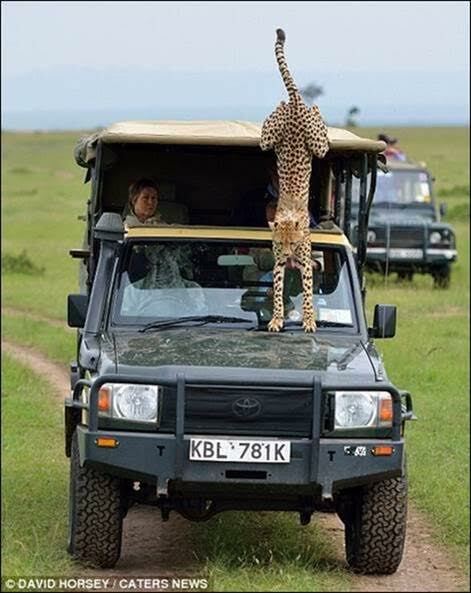 Having followed them for a couple of days previously, they observed that the family hadn’t had a kill for several days. David said: ‘The family had been looking for a gazelle for a few days with no luck. 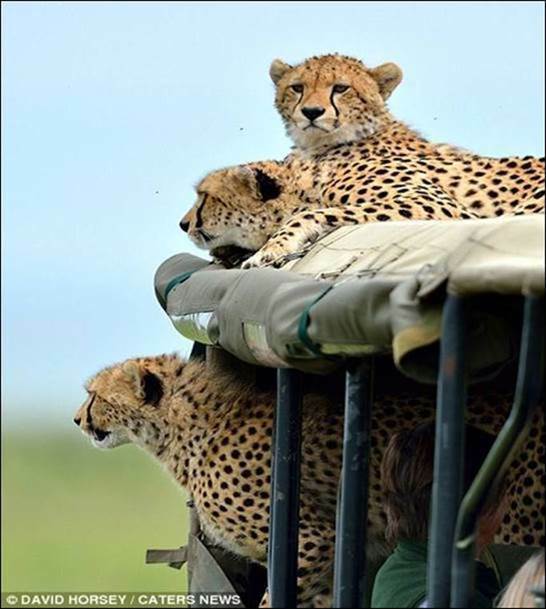 ‘As we’d been around for a couple of days, I think they were used to the jeep so the mum jumped on top to get a better view. 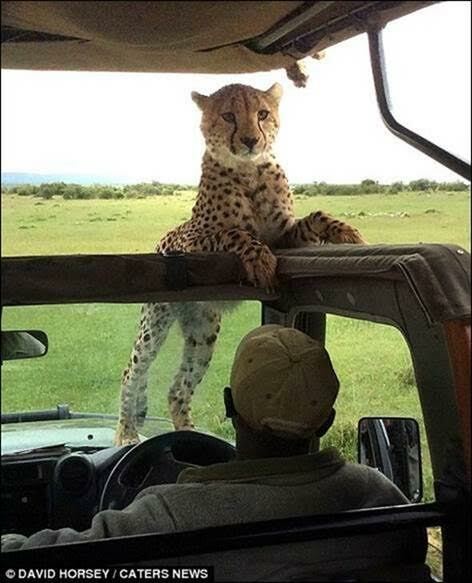 ‘I think the other cheetah tried to follow her up but went a different way. 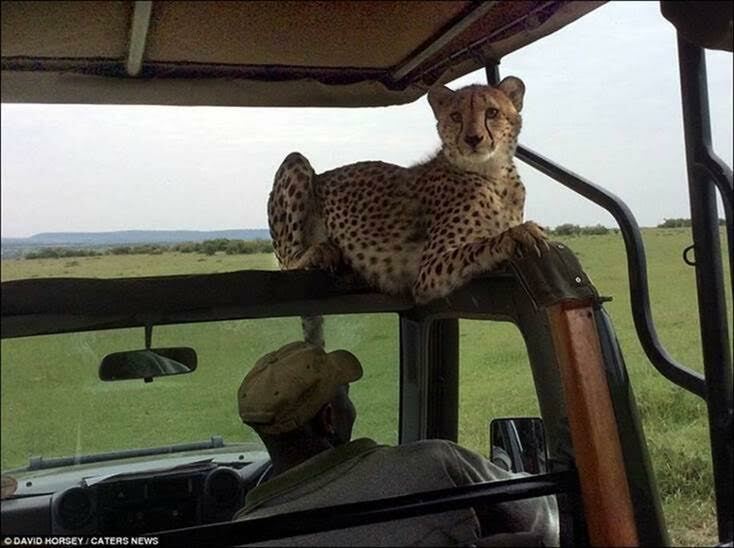 ‘Once it had got bored of Mickey it turned away and looked out of the vehicle for a few minutes. Surprise of their lives! 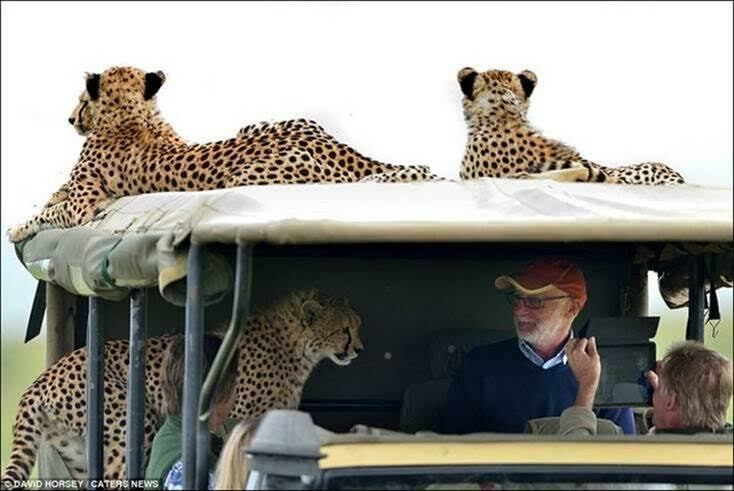 The safari group was comprised a guide, as well as Mickey, his wife, sister, photographer David and David’s wife. Mickey was out on holiday with his wife and sister, who are friends of David and his wife Vicky. David said: ‘Me and Vicky have lived in Kenya all our lives but we never feel the urge to leave. 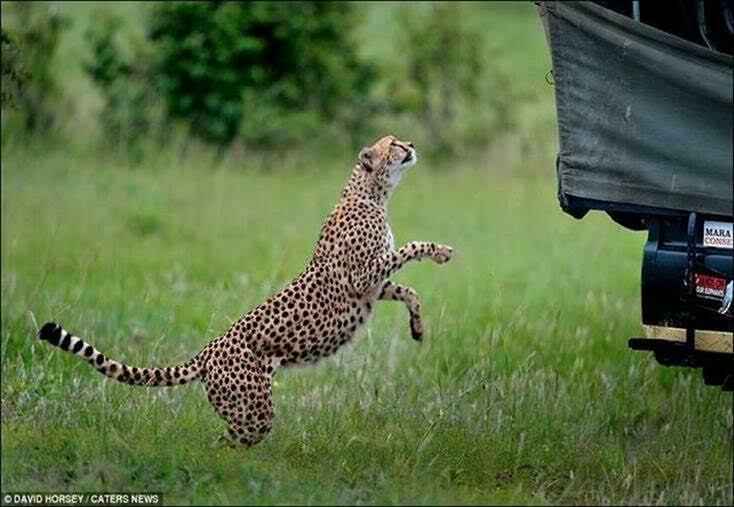 BIG CATS – BIG SURPRISE. PLAYFUL CHEETAH, MASAI MARA GAME RESERVE, KENYA. BIG CATS – BIG SURPRISE. 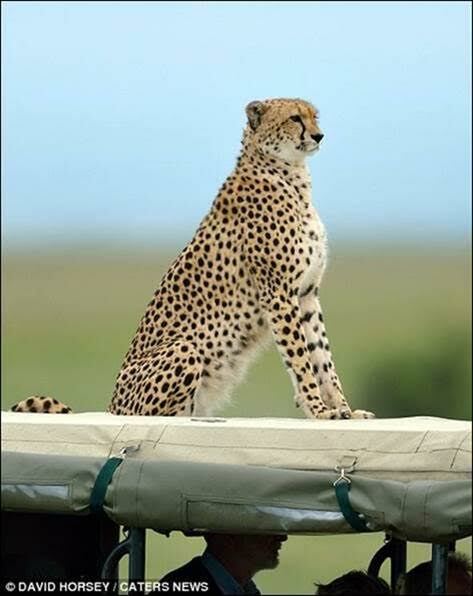 CHEETAH IN MASAI MARA GAME RESERVE, KENYA. BIG CATS – BIG SURPRISE. 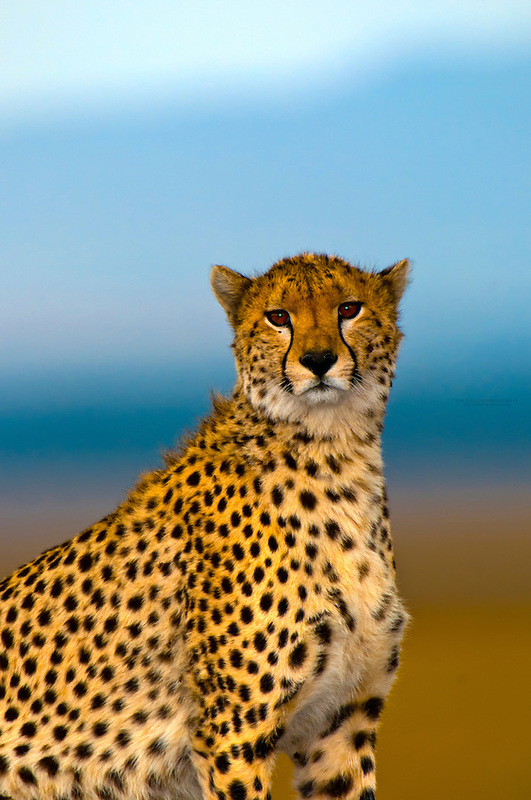 CHEETAH IN MASAI MARA NATIONAL RESERVE, KENYA. Photo @ Blaine Harrington. 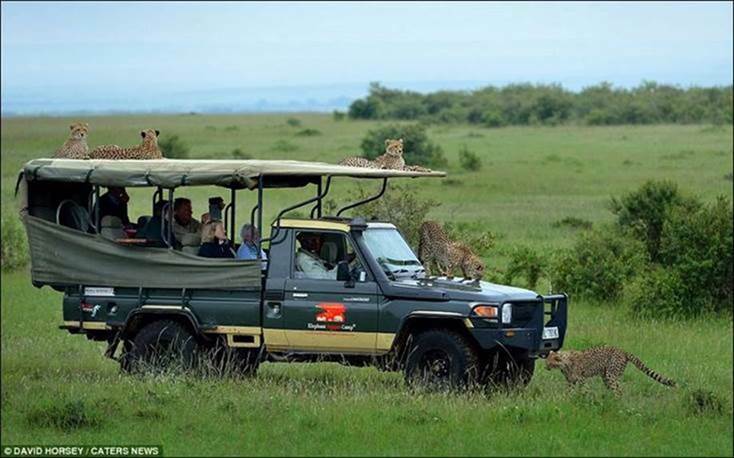 BIG CATS – BIG SURPRISE – CHEETAHS IN MASAI MARA NATIONAL RESERVE, KENYA. 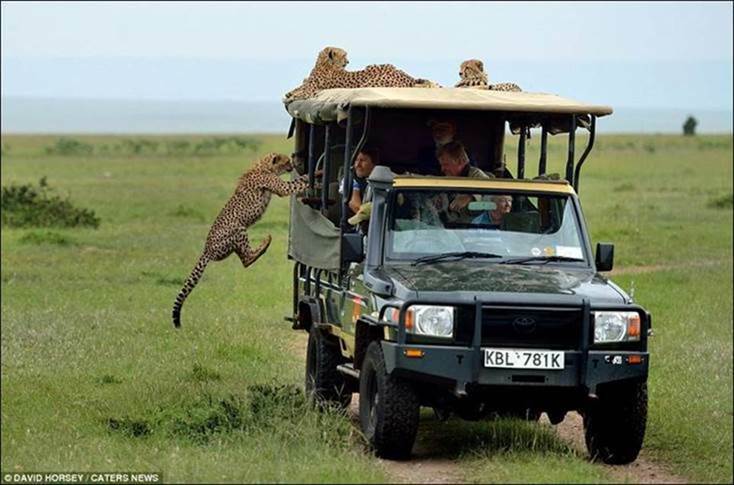 BIG CATS – BIG SURPRISE. CHEETAHS OF MASAI MARA NATIONAL PARK, KENYA. Photo @Mikkel.